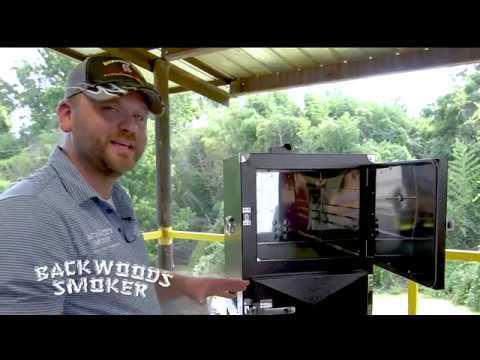 The Backwoods Chubby 3400 vertical charcoal smoker brings competition quality BBQ to your backyard! With four (4) nickel plated racks, the Chubby 3400 has a total 1,023 square inches of cooking area. An extra slider on the stainless steel interior walls allows the height of the racks to be adjusted for a more flexible meat arrangement. A heat diverter plate keeps the heat indirect, which allows for low and slow smoking at temperatures approximately between 180 and 300 degrees Fahrenheit. The stainless steel water pan can be used to keep food moist while cooking, or it can be removed to use the Chubby 3400 as an effective grill. The charcoal tray can hold up to approximately 10 pounds of charcoal at a time. As the charcoal burns, ash falls into a removable ash tray for easy cleanup. Between the stainless steel interior and the powder coated steel exterior is a 1-inch layer of insulation, which assures better fuel efficiency and temperature control. Both the firebox and the cooking compartment have slam latch doors, keeping them tightly closed so heat and smoke are not lost. A thermometer on the cooking compartment door lets you keep an eye on the internal ambient temperature. Weighing only 130 pounds, two people can easily lift and move the Chubby 3400 using the convenient side handles. Rack Size 16 1/2 X 15 1/2"
Backwoods Smoker warrants that this product will be free of manufacturing defects for one (1) year from date of purchase. 16 1/2 X 15 1/2" 18 1/2 X 18 1/2" 14 1/2 X 14 1/2" 22 1/2 X 22 1/2"
WARNING: The burning of charcoal may generate byproducts which are on the list of substances known by the State of California to cause cancer, reproductive harm, or other birth defects. To reduce exposure to these substances, always operate this unit outdoor and ensuring you provide good ventilation when cooking. For more information visit: www.p65Warnings.ca.gov.